Recirculators have a ring-shaped air duct. After sucking the air above the flight chamber in, diffusors recirculate the air to the fans. Recirculators may be operated independent of wind and weather, particularly outside temperatures and have significantly lower noise levels than open-flows and outdoor facilities. Year-round operations, energy efficiency and low noise levels are clear advantages. Due to the low noise levels, high quality recirculators may even be operated in the neighbourhood of residential areas. Compared to any other system, the turbulences in recirculators are hardly noticeable. 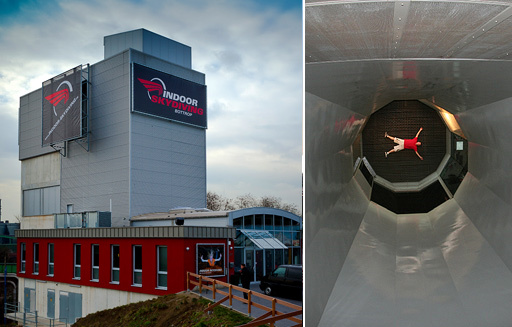 Consequently, the facility is likewise suitable for the entertainment industry and professional skydivers. Freefall is simulated at realistic conditions. The first recirculator worldwide opened in 2005. To our knowledge, there are currently four recognized vertical windtunnel manufacturers for closed systems worldwide.